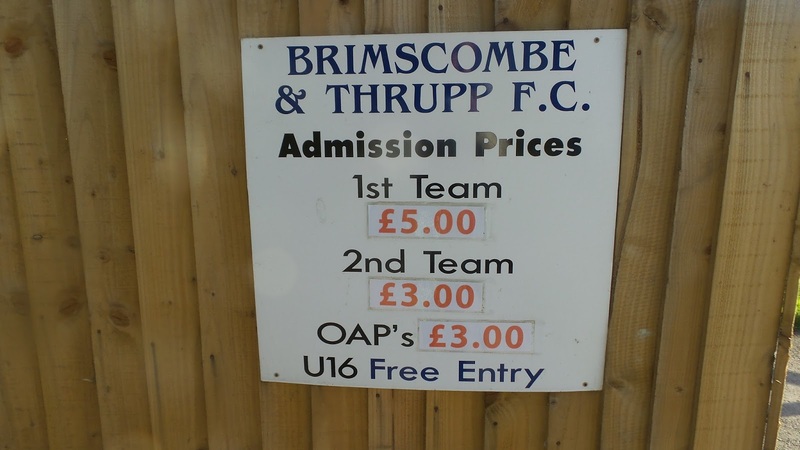 BRIMSCOMBE & THRUPP were formed in 1970's following a merger between two local clubs. 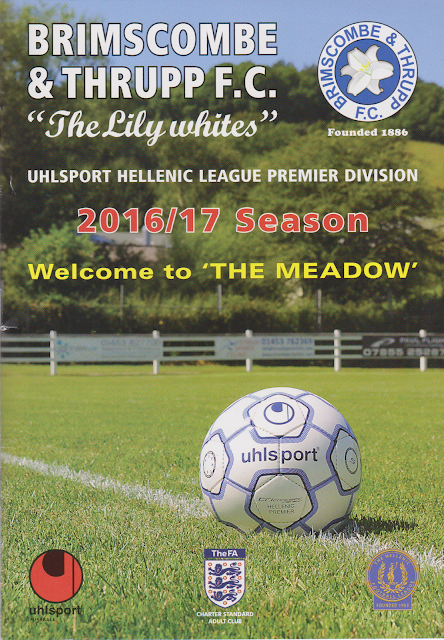 They played in local leagues such as the Gloucestershire League before joining the Hellenic League in 2011. 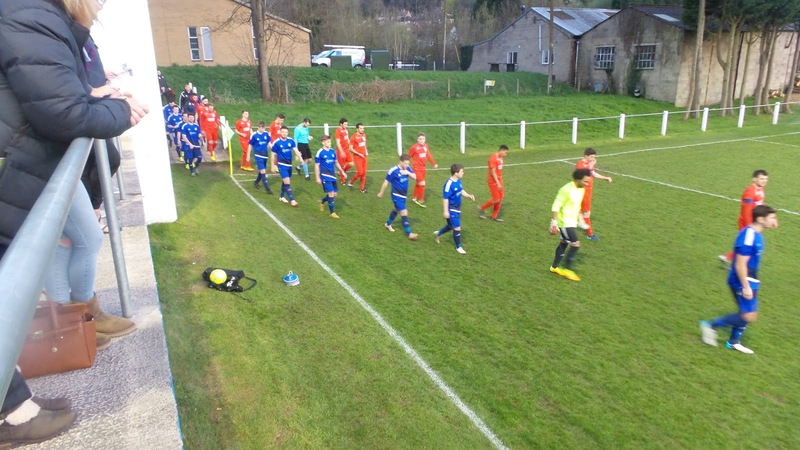 Starting in Division 1 West they had a credible 4th placed finish in their first season before finishing as champions in 2013. Since the 2013/14 season, they have competed in the Hellenic Premier and after two mid-table placings, they had their best ever finish to date when they came 5th. This season has seen a slight drop, with the side sitting in 7th at the time of my visit. 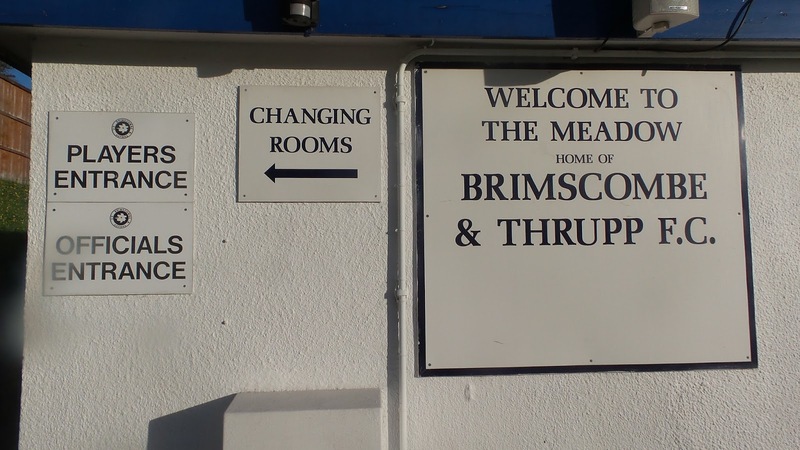 This season saw the club's best-ever run in the FA Cup when Brimscombe & Thrupp reached the 3rd Qualifying Round.After beating Henley Town, Highmoor IBIS, Peacehaven & Telscombe and Brislington their run came to a rather abrupt end when they lost 6-0 to Weymouth. 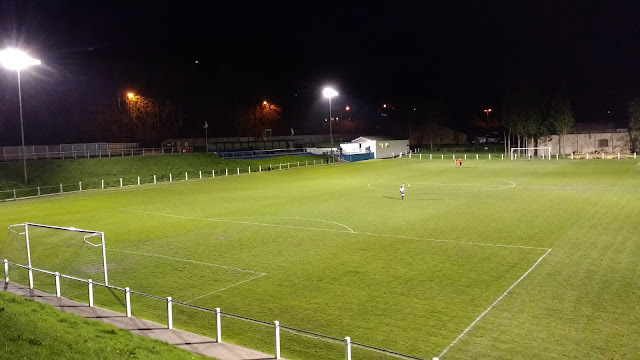 Last season saw them reach the FA Vase 3rd Round where they lost in a replay to Portsmouth-based Moneyfields. Locally Brimscombe & Thrupp won a trio of cups in 2013/14 when the Hellenic Floodlit Cup. 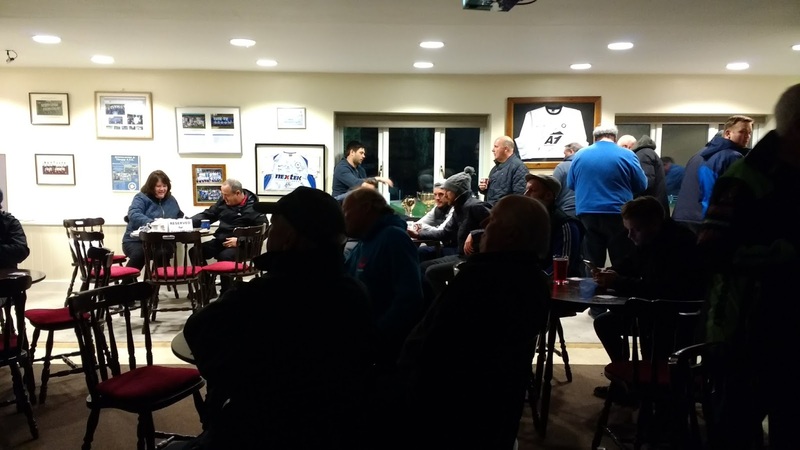 Hellenic Supplementary Cup and the Gloucester Charity Cup were lifted. I'd been meaning to visit Brimscombe & Thrupp for a while. It came up fairly regularly on the list of possibilities for a Tuesday night, though whenever it was our chosen game, it was promptly called off due to the weather. 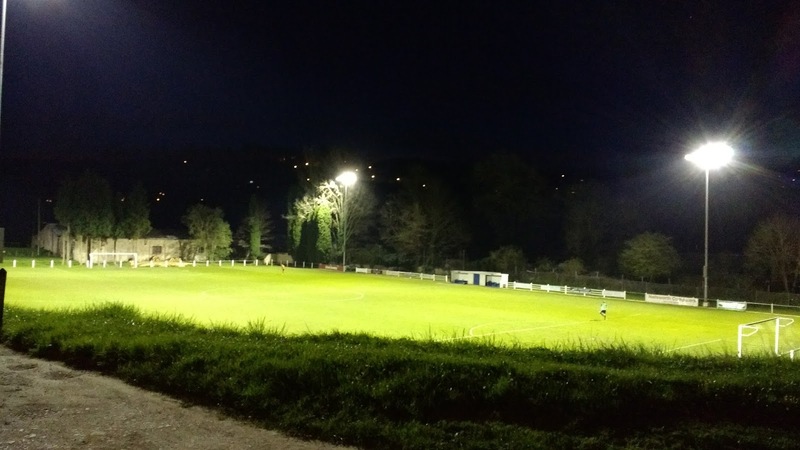 Finally, with the weather looking decent for this week, fellow hopper Anwar and I planned in the Perpetua Press Floodlit Cup game against Flackwell Heath. It was the start of a busy week for me, with me potentially seeing games for the next five days in a row, so I was glad to pick one of the nearer options to home. On the day of the game I was enjoying my usual day off and resulting walk down town. After coming back I was glad to find that my ticket for the Chelsea v Sunderland Premier League 2 game on Friday had arrived on what will be a fairly busy week for me. After lunch, I did some more work on my blog, including updating my Chelsea blog with details of my prior visits. A spanner was thrown in the works at 3.20PM with Anwar phoning to say that his MUm was ill and he wouldn't be coming. It was highly frustrating, but I guess you have to put family first. I had a quick look around for games but with options uninspiring elsewhere, I decided to stick with my original choice. 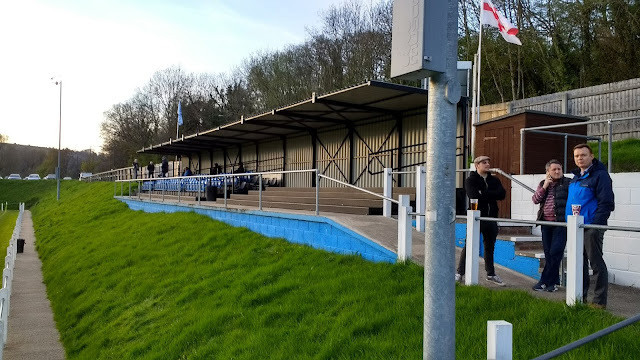 A trip to Gillingham Town was considered, but even though it was going soon, it didn't really appeal and would have made the trip even more expensive than it already was. At least at £5 Brimscombe would be good value entry, even if I'd be footing the entire fuel cost myself. I left at 4.20 and initially, the journey started well. There was the usual delay at the Cuttersloe roundabout in Oxford, around 15 minutes in all due to the poor design and inadequacy of the road to cope with rush hour traffic. There was further delay near Witney, but it wasn't as bad as usual due to the school holidays. I got to the ground at 6.30, paying £5 to get in which included a very good programme. After a brief look in the bar to see what ciders they did, I went down to the local pub. Both drew a blank in terms of new or interesting ciders so I decided to stick to my usual plan of not drinking during the week. I went to the chippy across the road for dinner. It was lucky I had time to spare as it took a full 20 minutes from paying to get my chips. At least when they came, they were freshly cooked and generous in portion for the £2 paid. I returned to my car as my camera needed charging and listened to the radio while I eat my dinner. With around 10 minutes to go, I made my way out to watch the game. Visitors Flackwell Heath were well on top at the start with Brimscombe having to resort to lumping the ball. When they did start to grow into the game and have some chances, Flackwell caught them out on the break. 20 minutes in, they had a shot that home keeper Luke Skyers fumbled and Sheridan Campbell was there to follow up from 6 yards. 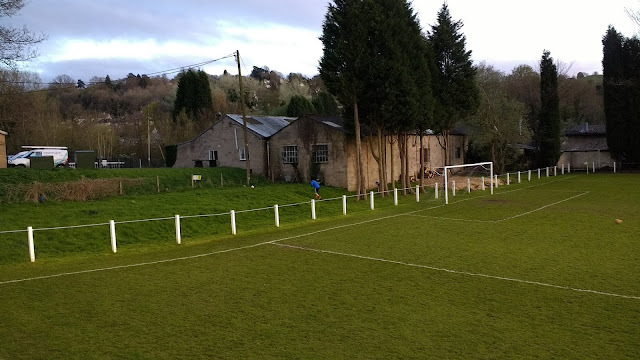 Both sides had chances before the hosts equalised on 57 minutes when Jack Smith's low shot from the edge of the area found the bottom right-hand corner. 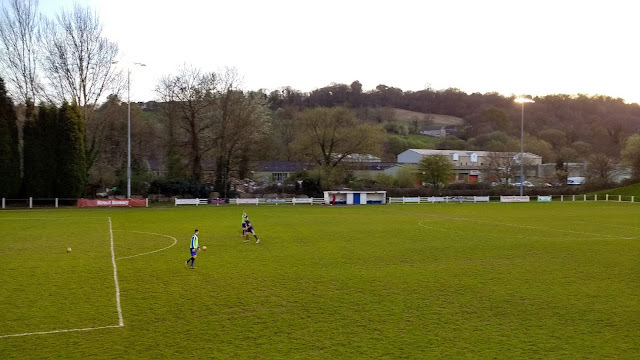 Brimscombe were probably the better side in the second half but they got done by a sucker punch right at the end. It was a last minute penalty that won the visitors. Home keeper Skyers went for a 50/50 challenge with a visiting forward. It looked as if the keeper had got there first, but the referee thought differently, sending the keeper off and awarding a penalty. Outfield player Josh Jones donned the keeper gloves and although he initially saved Ben Sturgess' penalty, the rebound was followed up to put Flackwell into the final at Kidlington next Wednesday. The game ended quite late and it wasn't until 9.50 that I left. I listened to the end of the Manchester United v Everton on the radio and like the game I'd just seen, the reds got a late penalty, in United's case to equalise. I made good time and got in at 11.15. After doing some of my blog,, I watched TV for a bit before going to sleep just after midnight.I'd enjoyed my evening and although it was more expensive than I would have liked, I knew I'd made the right choice. 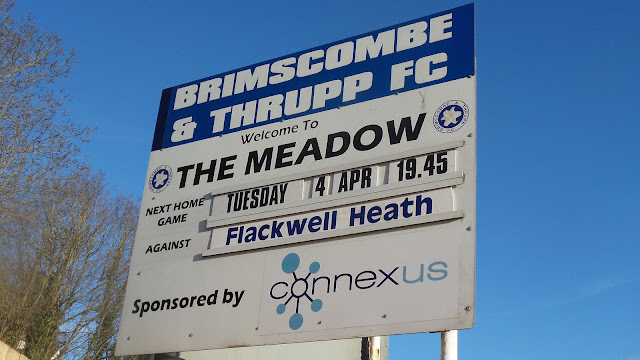 THE MEADOW was a ground that I first stopped for a look at on Tuesday 8th April 2014 whilst I was on the way to Shortwood United v Didcot Town. I was really impressed by the ground. Though the old classic stand that I'd seen in pictures had gone and been replaced by a newer structure the ground was still a corker, The new stand was a standard metal type structure that you see at so many grounds up and down the country. Split half and half between seats and standing this offers great views due to its vantage point. 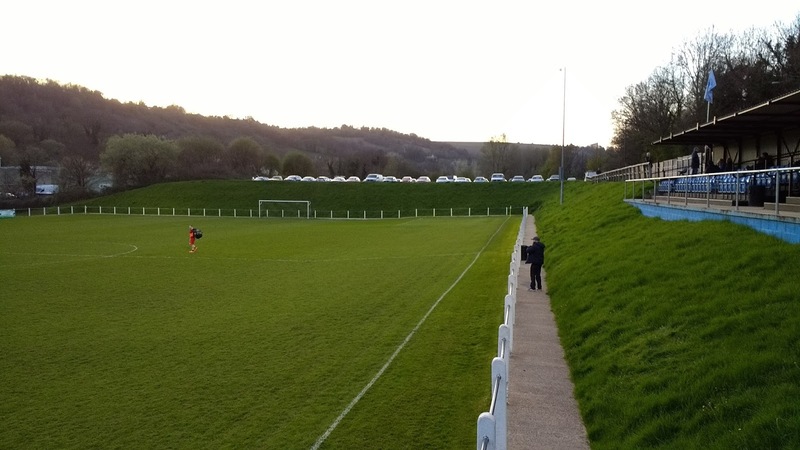 The whole ground is surrounded by grass banks, which means that you can get a really good view of the action. 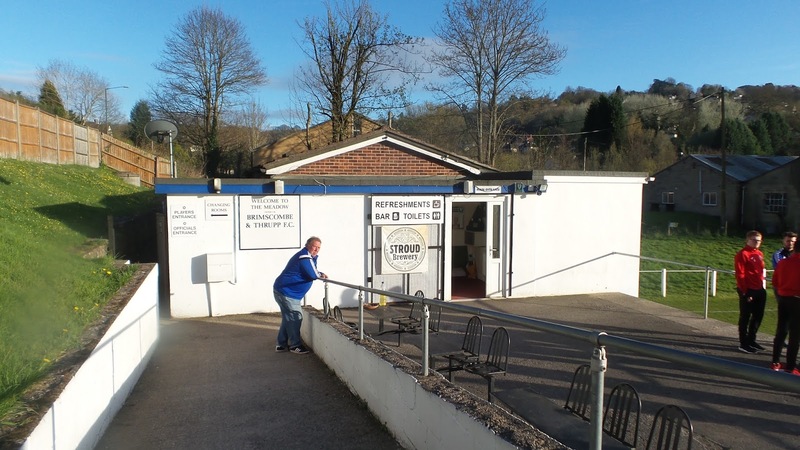 There is a pub just down the road from the ground, but it's nothing special so you may as well drink at the ground and give the club the money. 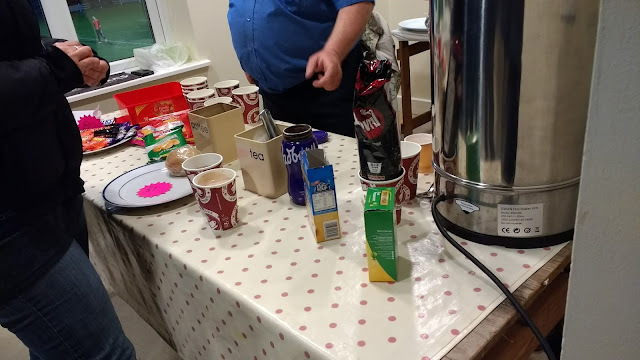 The tea bar was restricted to snacks and rolls when I went, so it's a good job there are options nearby. There's a chippy down the road, albeit with fairly slow service as well as a doner kebab van in a nearby layby. Club badges and ski hats are on sale from the turnstile.